In August, summer finally came to Seattle, after a cold and wet spring that seemed to go on through the end of July. Unlike some groups that take the summer off, we sing Compline throughout the year, and the attendance does not drop off, even on really warm days. In fact, we had about 700 people on July 31; about 300 of these were members of the Association of Lutheran Church Musicians, who were beginning their national convention. Our friend Carl Crosier and his wife Katherine, a fine organist, came back to greet us after the service. Carl was inspired by Compline while attending college in Seattle in the late 1960s; when he moved to Honolulu he founded a Compline Choir in 1976, which is still going strong after 35 years. This August he retired as Cantor (music director) of the Lutheran Church of Honolulu. Carl, congratulations to you! Any time you want to write a guest blog here, just let me know! In the meantime, you can read about their doings at Katherine’s lively blog about church music, “Another year of insanity”. I always look forward to the month of August at Compline, especially around August 15 when Anglicans celebrate the Feast of St. Mary the Virgin, which is also the Roman Catholic celebration of her assumption into heaven (Orthodox Christians who keep the Julian Calendar celebrate it on August 28). For over a decade now, we have sung as our anthem the Franz Biebl “Ave Maria” for men’s chorus. This is a setting of the Angelus, a prayer originating in the eleventh century and traditionally done three times a day – 6am, noon, and 6pm. 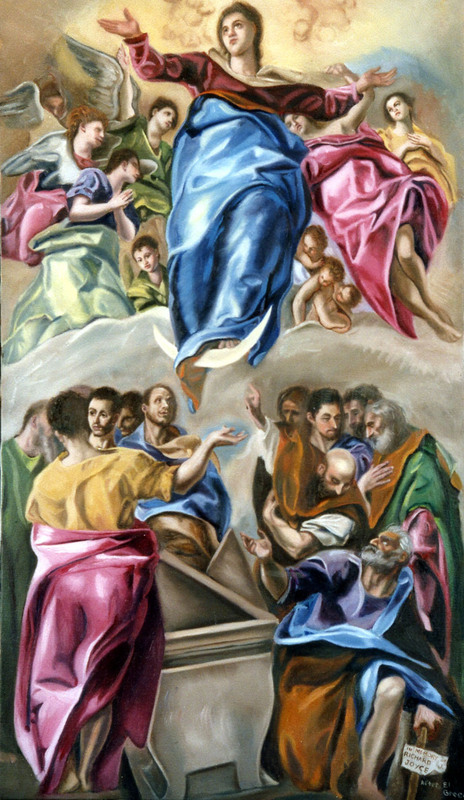 There are three verses describing the annunciation of the angel to Mary, each followed by the Ave Maria; in Biebl’s setting, the complete prayer is only heard on the third repetition. At Compline, we also sang as an orison the Salve Regina chant; this is the Marian antiphon normally done at the end of Compline in the Roman Rite. There are four Marian antiphons, and the Salve Regina is appropriate to the time between the feast of Trinity and the first Sunday of Advent, which encompasses the whole of summertime. I hope you listen to our podcast for August 14 (press the “Play” button – the Biebl Ave Maria begins at about 25 minutes into the podcast – translation is in the Angelus link above). It was cloudy today in Seattle, and September is just around the corner. I’ll be writing again soon about a group that, starting September 11, will be singing Compline every Sunday, with live video feed!